Hello person reading this blog. You will learn how to set up and control a DC motor with the BeagleBone Black RevB (BBB) and L293D IC. Your Bread Board, A L293D IC, A DC motor, 5v power supply/battery pack, and Jumper wires. In Step 1 we are simply turning on the motor. Double check your wires before you supply power to the IC. IF the motor does not start spinning once you apply power from the BBB and the 5v power supply UNPLUG EVERYTHING and double check that the wires are correct and that the power from the BB and power supply are correct. We just setup the IC's inputs to send the power to the motor to cause it to spin at full speed in one direction. Move the orange wire from power to ground leaving it connected to pin 2 of the IC and then move the purple wire from ground to power leaving it connected to pin 7. Notice that the motor starts spinning full speed in the opposite direction. Move the Blue wire from power to P9_14. In step 1 we set the EN pin on L293D (Pin 1) to on always. In this step we are turning it on and off using the duty cycle. From 0% to 100% speed. As you put in different numbers you will find that there is a certain point, below which your motor no longer spins. For me that happened at around 53. Changes from Step 1: Move the Purple wire from ground into P9_11, and move Orange wire from power into P9_13. In step 2 we turned the EN switch on and off, using PWM, to control the speed of the motor. 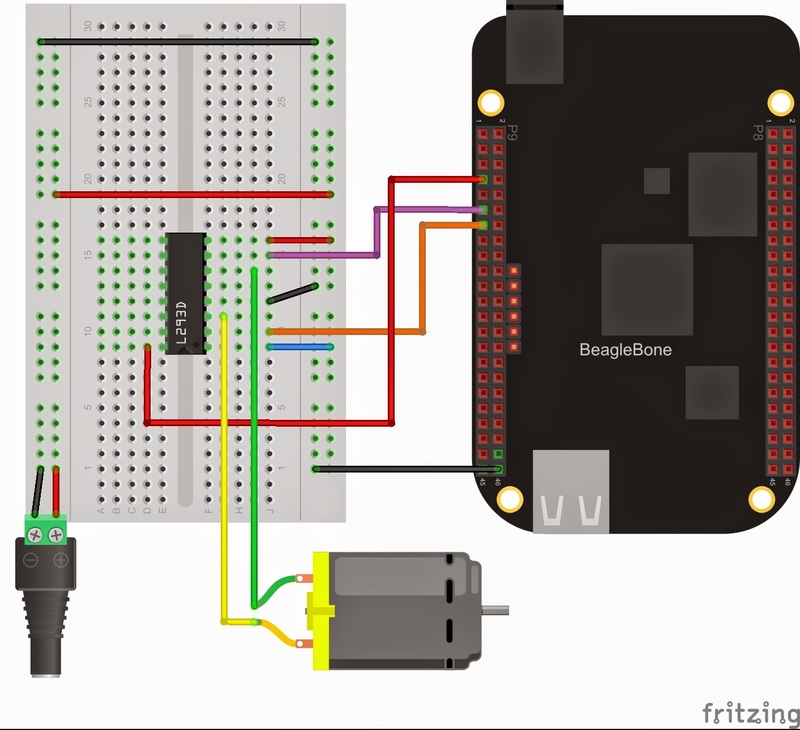 In this step we control the motors direction based on the value sent to the GPIO pins. 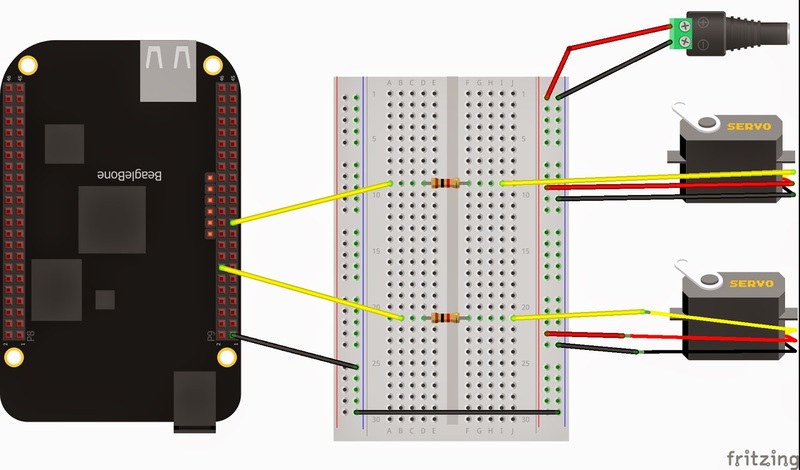 According to the L293D documentation the two GPIO pins must be opposite for the motor to run other wise the motor is set to brake mode meaning if it was running it will do a hard stop. Changes from step 1: Move the Purple wire from Ground into P9_11, Orange wire from Power into P9_13, Blue wire from Power into P9_14. We put what we learned from the other steps to put it all together. Now go forth and control the world one motor at a time. I keep hearing how awesome this AngularJS (Angular) is. Thus, I will walk through a tutorial and make a webpage with Angular to see what I think. Angular is a Model View Whatever (MVW) Framework meaning it has a data structure in the background which feeds the view with the data to display to the user, allowing you to update the page and post the updated data easier. Angular has some really cool features built in. Angular expects you to follow a certain design and implementation path. It allows you to do things a different way but it makes life hard if you try. Doing Test Driven Development (TDD) with Angular is simple and suggested. The Angular community is active and alive (they're not robots). The page has 2 Angular plug-ins that allow me to add in the rating with stars and also to do local storage (no db). Since both plug-ins followed the Angular design there was no fancy do this or do that to make them work. To set up the local storage plug-in with Angular, I simply including the JS file and referencing the local storage variable in the angular controller. With the rating plug-in I added code to the view so the plug-in would know where to store the data and how to display it. The one big downside I have seen with Angular, which could also be a big down-side for you depending on how you intend to use Angular, is that Angular is strict on its usage and how the data flows. IF you have an existing project you will have a hard time adding it to that project. Another issue is Angular no longer supports IE8. These two issues will limit my use of Angular in my world since most people want support for IE8 still and/or already have an existing project. Conclusion - I would only use Angular if I was creating a new app focusing on 'new' browsers. I do know that you can get Angular to work with IE8 or IE7 but who really wants to do that? Makes handling Client side easy and dynamic. I found that after playing around and using Angular I was able to easily create, manipulate and show data. It has traditionally been a pain to do that on the client and it added a nice layer of structure. Being designed with TDD in mind makes it worth putting the effort to do TDD. If I am able to use Angular in future projects I will. Once you use Angular you will see the light at the end of the Angular tunnel, I promise. So you have a Beagle Bone Black (BBB) and bought the TP-Link TL-WN722N wireless adapter. WOOT me too. Then you went off and installed Debian onto your BBB. Wow you and I are like twins. But now you can't find anything that points you in the directions on how to get your newly found wireless adapter working darn internet. GOOD news this will help you with that. Working assumptions you have installed Debian on to your BBB and you do have a TP-Link TL-WN722N. If any of these assumption are wrong then I can't say these steps will work. Step 3: Install the wifi libraries. Step 4: Download and install the firmware for the wifi card. Step 5: Adding the adaptor info to the interface file. Add to the bottom of the file. Step 6: Plug the Wifi card in. Step 7: Make sure system sees the wifi card. Step 8: Make the wpa.conf file. Step 9: Lets start this thing. Step 11: Do a dance cause it is connected. If not try turning off the BBB and turning it on again. Hello to all that have stumbled across this blog. What we do in this blog is pretty simple I write things and you read (or don't read) what I write. Disclaimer: I am no English expert so if you see something that is not grammatically correct then correct it mentally and move on. Miss spellings are going to happen it's life in my world I will do my best not to make them but it will happen. Some things you will find me writing about. I am getting in to programing ARM processors and I have a beagle bone black Rev B. I am also a consultant that writes C# code so maybe things on that. Some things with Node.js and some other things. Some of the blogs be how I did things and some of them will be my thoughts on the language or code or process. All in all it will be just be a bunch of geek/nerd/programmer things. This is my first "technical" blog I have ever written so don't be surprised as I post more that more "cool" things show up in it. Well we will call this the end to my first blog about what my blogs will be about. Enjoy life and just remember don't look back to much you may trip over something in front of you.